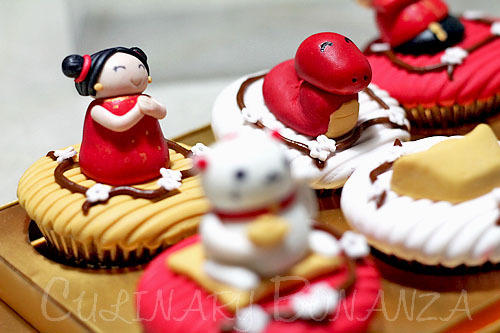 Lomunar Pastry's CNY-themed Cupcakes, a gift from our family-friend. This year's Chinese New Year unfortunately, falls on Sunday. I say unfortunate, because it means there was only 1 day to visit the relatives' and friends' houses. For those who are not yet married (like me), we collect angpaos (red envelopes with a sum of money inside) from those already married. 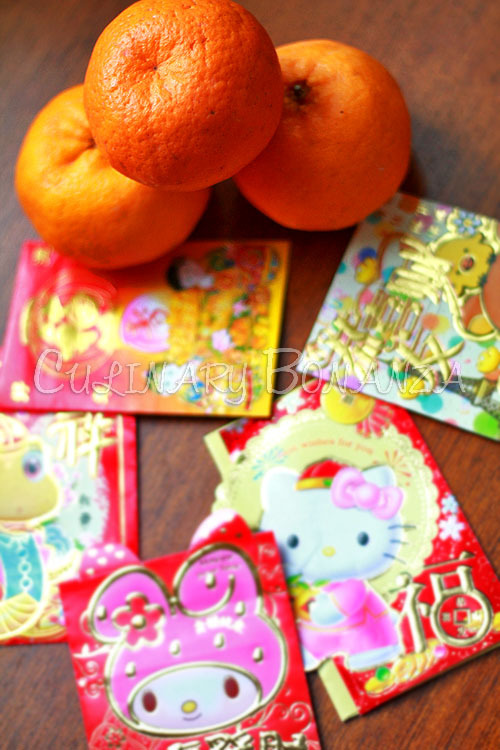 The habit of giving angpao is more of a tradition and cordial gesture, so the amount does not really matter. Although it sure feels quite funny to receive angpao from my same-aged cousin who just got married this year. On the eve of this Chinese New Year, my Mum has prepared the above spread for the whole family. 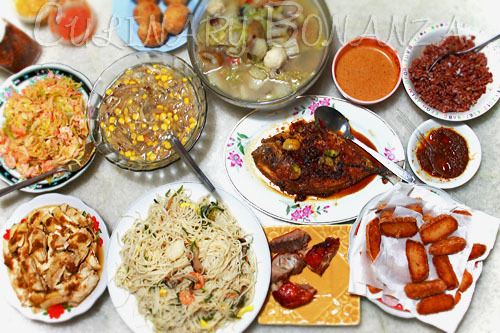 Since my family has a rather picky palate and being Chinese Indonesians, we are not that superstitious, hence the spread is prepared more to satisfy the taste buds rather than to stick with tradition. 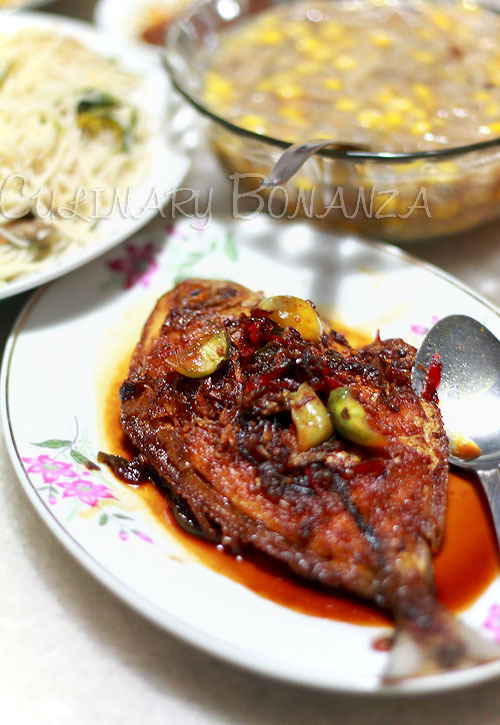 Although we still include a few dishes that has its cultural significance such as Mee Shoa, fish, chinese garlic chives stir-fry and chicken. Chinese garlic chives (above) - Represents everlasting, eternity, long life. Haisom or hai shen in Chinese or teripang in Indonesian is sea cucumber. One way to cook it, is to make a soup mixed with lettuce & fish balls and other ingredients depending on personal preference. 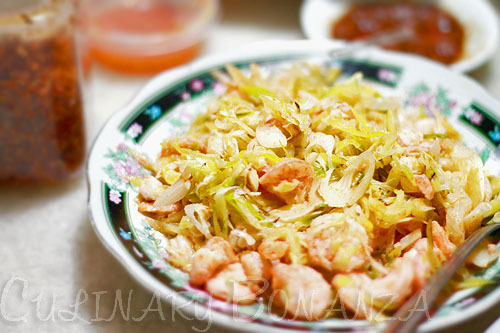 This is quite a popular Chinese delicacy and is actually quite expensive and arduous to prepare properly. 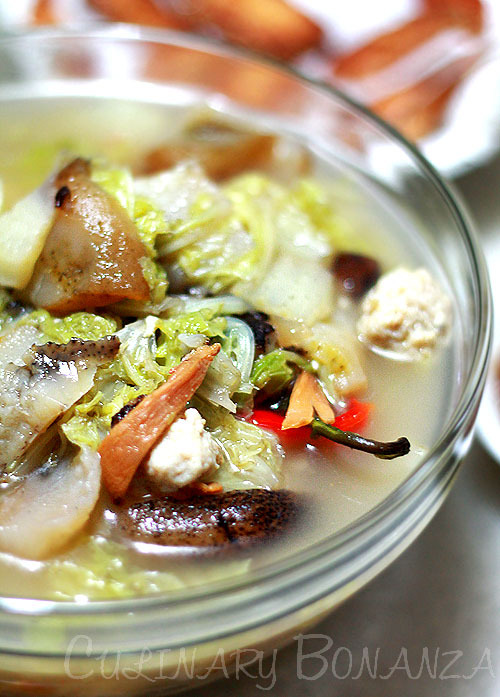 Therefore, haisom soup is normally served only during festivities like the Lunar New Year. It is steamed kampung (free-range) chicken marinated in garlic and oil. 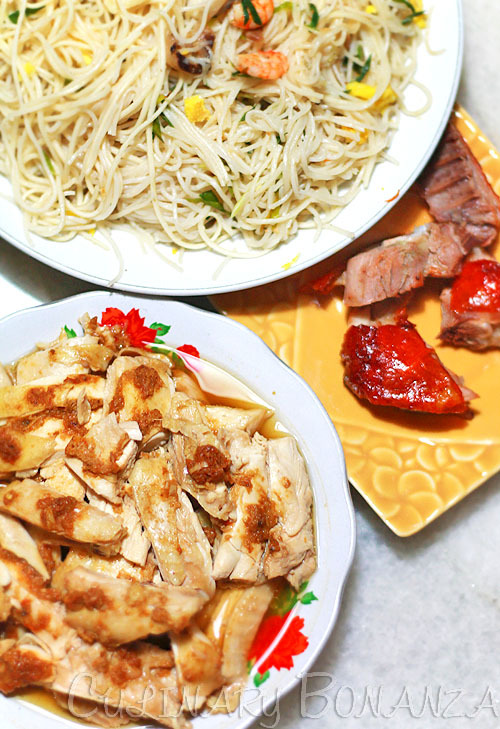 The inclusion of chicken in CNY eve dinner has its origins from the belief that whole chicken (complete with its head, tail and feet) signifies unity and togetherness of the family. The long noodles represents long prosperity, long life (longevity). The noodles is a special type of noodles, not like the average curly egg noodles, but it is not quite like spaghetti, because mee shoa is more slender and pale in colour. There's a Chinese saying nian nian you yu which literally means: (financial) surplus every year. The last word, yu, has the same pronunciation as the word fish in Chinese (yú). That's why fish is normally prepared whole, from head to tail. Literally means fried prawn cake. It does not appear in every Chinese family dinners, but since this is our family's favourite, we always include every CNY eve dinner. 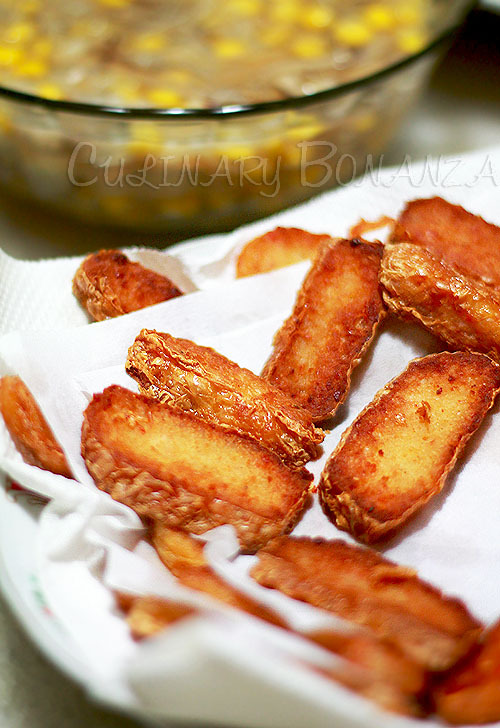 Also known as nastar in Indonesia, this treat is among my favourite CNY treats. 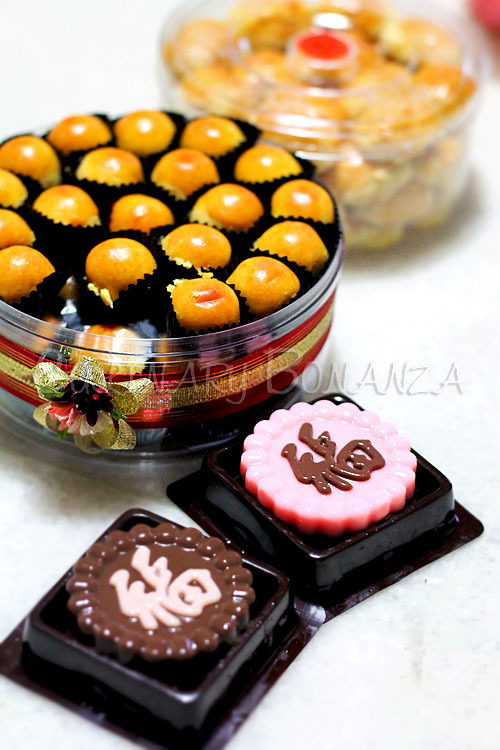 There are different versions of pineapple tarts, some have crispy shell, while others have soft and buttery shell. My favourite? My mum's home made pineapple tarts no doubt. 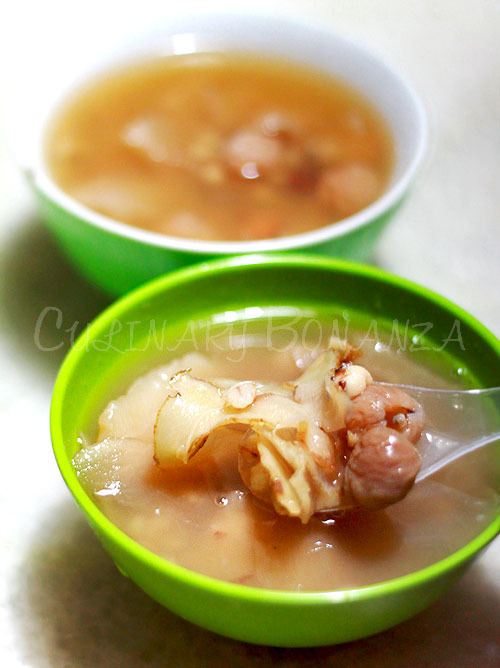 A type of Chinese dessert (tong shui - literally means sugar water) that's often cooked during Chinese New Year and other auspicious occasions (weddings, etc), Cheng Teng is a clear soupy dessert made with ginkgo nuts, barley, lotus seeds, dried longan, sea coconut and other preferred ingredients. This dessert, besides being tasty, is also believed to rid of the body 'heat' and many other nutritional benefits. Oranges - represents wealth, good fortune, gold oranges are a popular symbol of good luck. The word orange in Chinese has some resemblance with the word good luck, hence, the norm is to present oranges to the host we visit or to the elders in the family. Nian gao (kue keranjang) is a sticky cake made from rice flour & palm sugar. This symbolic sweet represents united family (being sticky), higher improvements (the word gao means higher), and of course, sweeter fortune (the cake itself being ultra sweet) in the new year. PS: it is easier to cut nian gao using thread instead of knife because it would stick on the blade. What a feast, El! I'm dying to try the pek cham kee, been a while since I had a great one! El, I think you should make a special post on step by step how to cut Nian Gao a.k.a Kue Keranjang using thread. This is the 1st time I heard/read about it, and I was astonished! Haha..